Hattie Brooks has traded her homestead life of plowing, scaring off wolves, and placating fussy chickens for the more predictable drudgery of mopping up at Brown’s Boardinghouse in not-so-Great Falls, Montana. 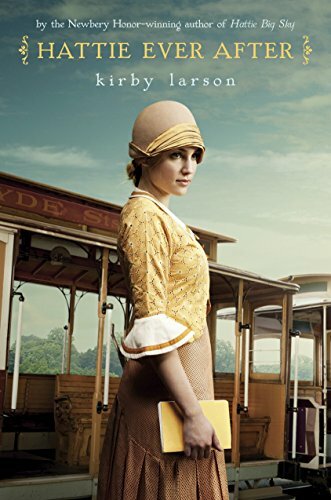 When a vaudeville act comes to town and offers her a job, Hattie grabs the chance to move to San Francisco, where she can chase her dream of becoming a big-time newspaper reporter. The San Francisco of 1919 presents the strong but naïve young Hattie with a bewildering array of people and possibilities. One of the city’s attractions for Hattie is its connection to Uncle Chester, who died and left her the land in Montana (the setting for Ms. Larson’s first novel, the Newbery Honor-winning Hattie Big Sky). She has learned her uncle left behind a sweetheart, who might be able to shed light on the benefactor she never knew. Forever hopeful, Hattie sets about tracking down the woman called Ruby. Hattie not only finds Ruby, but she also trades her work with the vaudeville act for a cleaning job—at the buzzing offices of The San Francisco Chronicle. She decides to keep the humble nature of her new job to herself, as even those dearest to her—Perilee, her sisterly neighbor forced to abandon Montana; and Charlie, who has some claim on her heart and would no doubt question the wisdom of her choice. Their clear preference is for Hattie to join them in Seattle. But of course, one reason Hattie remains such an engaging protagonist is her sassy, resilient nature that enables her to overcome the challenges of being an orphan on her own. While the conflict in this fast-moving sequel might not encompass the first novel’s dramatic descriptions of such life-or-death matters as hunger, racism and war, Hattie Ever After packs in plenty of high stakes risks to engage both new and returning fans of Hattie. No stranger to taking on unlikely goals, Hattie aims to become a reporter in a cutthroat, male-dominated industry. She might be a cleaning woman today, but she keeps on writing. Instead of describing her life on the prairie, as she did in the first novel, Hattie focuses on the diverse places and people around her, such as the hardworking independent women who clean the offices. And she takes advantage of her lowly position at the newspaper to spend her breaks with the stacks of old papers in the morgue. Fortuitously, this practice helps bring her to the attention of the overworked news desk. Soon, Hattie’s job includes a few hours of researching questions for the reporters. It appears Hattie’s on her way, especially as a certain handsome reporter, Ned, takes on the role of mentor—and perhaps, as a suitor, as well. The author, however, shows Hattie’s growing maturity as she learns to rely on her own abilities, to be true to herself and her feelings for Charlie, and not to trust every smiling face. Ned, in fact, turns out to be one of two devious characters hiding a benign façade. Hattie’s big break arrives by way of a humorous convergence of surprising events that encompass her superb pitching skills, an opera diva, a pilot itching to show off, and a brusque, older reporter who urges the budding writer to soar—literally. Hattie has the chutzpah and the talent to pull off a coup that will lead to her own bylines—and the career for which she yearns. Hattie Ever After provides a welcome view of a likable young woman’s full-throttled claim on life in the early 20th century.